On this page, I will share my thoughts about an inspiring biblical book every month. These are the books that are part of my personal library. I have read them recently and recommend to be part of your future reading plan. You may have realized that living a Christian life is about others but do you struggle with incorporating this view into your daily life, especially at your workplace or business? Do you struggle to live for Jesus while earning a paycheck? How do you share your faith with those around you? What happens to your faith at work? If you take Christ's command to “go and make disciples of all nations” seriously, this book will be a great help for you. 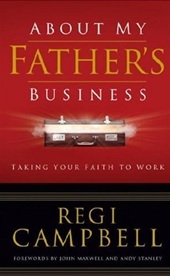 "About My Father's Business" is more than a typical Christian book. It is a discussion of the calling and the lifestyle of "making disciples". As a result it makes the reader deal with issues of our heart like "How much do I really love the people around me?" and "What are the core motivations of my life?" This book is compelling because it is written by someone who is living it. Regi's corporate and entrepreneurial experience coupled with his commitment to the Christian community make for a dynamite read. His experiences are entertaining and engaging. His practical tools for serving others in the workplace are very helpful. This book will challenge you to live a life of daily dependence on the guidance of the Holy Spirit and to live sacrificially out of the overflowing gratitude in your heart. My recommendation: This excellent book gives practical wisdom on how to share your faith in Christ without scaring anyone away. The author speaks from his personal experience as a successful businessman & professional living out his faith in Jesus Christ. The principles in this book will change the way you see people and will have a significant impact on your work or business. I recommend this book to anyone wondering how to move their faith from a Sunday only experience to applying it every day. Whether a new believer trying to grasp what it means to be a Christian or a life-long believer trying to live for God, this book is a practical guide to living a life that will produce eternal results. This is a book that you will buy extras copies to give to your friends. God is calling you to more than what’s in your job description. Your peers need it. Your Father requires it. It’s His business and only you can accomplish it.